I got Clare Morrall’s ‘The Language of Others’ a few years back while browsing in the bookshop. I liked the description of the story and so thought I will get the book. Morrall’s first book ‘Astonishing Splashes of Colour’ was shortlisted for the Booker prize. ‘The Language of Others’ is her third book. I have wanted to read it for a while now, and so now I thought I will read it as part of the British Women Writers series. Here is what I think. ‘The Language of Others’ is a story which has plot strands set in three time periods and tells the story of Jessica, who at the present time is in her forties, and who is a librarian and also a musician who gives piano concerts with her friend Mary. Jessica has a grown up son who is in his middle-twenties, has his own business and lives with her. Jessica is single. One day Jessica gets an email from her ex-husband Andrew, who says that he wants to meet her. After this the story moves back and forth between three time periods – the present, the past when Jessica is a young girl living at her parents’ place, when she is shy, introverted, likes being left alone with her piano and doesn’t like talking to her parents, sister or cousins and a third time period which is in between these two times, when Jessica is in college studying music where she meets Andrew and falls in love with him. What happens between Jessica and Andrew and why they have reached the situation they are in today, why Jessica is working as a librarian when she trained to become a musician, why Jessica’s grown up son still lives with her, why Jessica was quiet and introverted and wanted to be left alone when she was a child and whether she is still like that now – the answers to all these questions form the rest of the story. I loved ‘The Language of Others’. Clare Morrall’s description of music is very beautiful and one of the most natural that I have read. Most of the time, when an author writes a book which has a classical music backdrop, I find that the description of music is very general and very soon the story explores love, death or other themes and the music part of the story is ignored. I suspect that this might be because the author doesn’t have expertise in music and for a non-expert it is difficult to write about music naturally and authentically (beyond mentioning a few composers, a few musical instruments and then saying that the music was divine or heavenly or enveloped the audience warmly like a cloud). But Morrall’s passages on music are brilliant, authentic and natural – they have enough technical information without intimidating the musical novice and they are also beautiful and transport the reader inside the story into the music scene. It is a difficult art and Morrall is an expert at it. It must have helped that she is a music teacher too. This was one of the first musical passages which made me fall in love with the book. The violin player started to play sections of concertos – Tchaikovsky, Sibelius, Beethoven – carelessly, tossing them off into the air like quick flurries of rain. Each one swirled around in the wind for a few seconds, sharp but brilliant, uncertain whether to settle for a serious downpour or move away and give up. For a book which I fell in love with, it also made me angry, quite angry. There were many scenes in the story where the heroine Jessica gets bullied by different people and it continues till the end, till she learns to resist them and fight back. I hate bullies and I hate nice people being bullied and the scenes where Jessica suffers at the hands of bullies were quite realistic and they made me quite angry. I am normally quite calm and never get angry when I read a book, but this was an exception. I liked the old-fashioned way of storytelling that Clare Morrall had adopted. It almost read like a Victorian novel written in modern language. I don’t think that there was a word or a sentence or a scene wasted and the sentences were constructed beautifully and they all made the story move forward. All the characters were well fleshed out. My favourite characters were Jessica, her friend Mary, her son Joel’s girlfriend Alice, her mother Connie and her piano teacher Thelma Gulliver. Jessica’s ex-husband Andrew and her cousin Philip were two characters that I didn’t like (and who made me angry) but they were important characters in the story. Traditional storytelling, interesting characters, beautiful prose, musical backdrop, powerful scenes which make one angry and happy and sad, an ending which had a surprise but which was also very satisfying – what else does one need? ‘The Language of Others’ is a perfect novel. I can’t believe that I waited for so many years to read it. I know we have not reached the half way point of the year yet, but I can safely say that ‘The Language of Others’ is and will be one of my favourite books of the year. I can’t wait to read other books by Clare Morrall. I want to read all of them. I couldn’t really understand what Andrew saw in me. It was as if a shaft of brilliant sunshine had decided to push its way into a dark corner of the house where it wouldn’t naturally go, turning a corner to get there, penetrating walls that obstructed its progress, breaking all the laws of physics. I was fascinated by the way people changed when they dressed up, became someone different. They shimmered and glittered and it was like placing them in front of a mirror, turning them through 360 degrees, and finding them altered when they came back. The same people, the same features, but subtly different. The nose that had seemed too big became elegant, the lips that protruded too much became full and individual. Skinny people became slim, fat people warm and shapely. I began to see what attracted people to each other. A glistening aura that was not normally on show. Her left hand started to stroke the repeated A flats with a gentle insistence, establishing a constant presence, but taking a passive role, hardly there at all. The right hand sang out, cantabile, easing its way through the simplicity of the melody. Rubato, indulgent, taking its time. Each phrase rose and fell, shaped and polished with love. This was how you played Chopin. It was music for the nineteenth-century salon, a piece to impress George Sand and the cultured circles of Paris, who, like Thelma Gulliver, were all slightly in love with the consumptive, temperamental composer from Poland. Pretence gives you room to get round obstacles without touching them, the space to observe that there are other sides to people, not just the abrasive, challenging attitude that you can’t cope with. You have to view people from new angles, see where the light falls, discover which edges have been worn down and softened with time. Otherwise you get so caught up in the negatives you can’t see anything else. I want to hear the echo of nothing for miles around. I want to be the only person who can disturb the air when I walk through my house. I can feel it parting to let me through, closing up again behind me. The silence soaks into my mind, an invisible medicine that drips down, melting hardened arteries, easing its way into neglected and forgotten places. Apparently, loneliness is a twenty-first-century disease which leads to alcoholism, drug-taking, depression, suicides. It’s better to be married if you want to live longer. I defy all of this research. I thrive on the emptiness of my house. 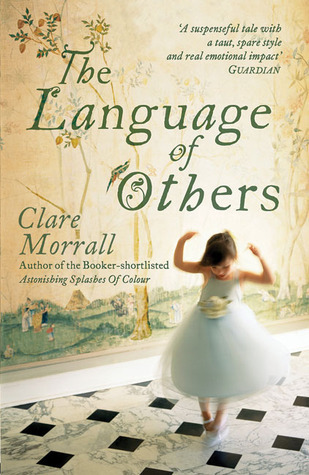 Have you read ‘The Language of Others’ by Clare Morrall?